On Saturday, 31 of October opens a new exhibition with the Malmö-educated artist Celie Eklund, who now operates from Stockholm. The exhibition ”To what became” goes on until Sunday 22 of November. In Celie Eklund’s new exhibition ”To what became”, we meet symbolically charged paintings where there is both fragility and strength. Stockholm suburb, the grove of trees and the beach are in Eklund’s paintings the scene of universal questions about the vulnerability, protection and defense, togetherness and belonging. It is a narrative work in which Eklund has a dialogue with what has been, what is and what should be taught. 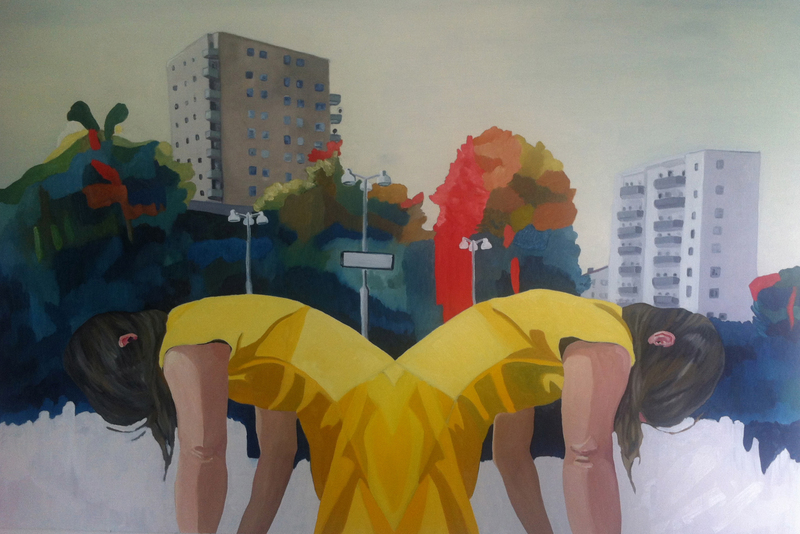 Celie Eklund was born in 1982 and lives and works in Stockholm. She studied at the Royal Art Academy in Stockholm, and has a master’s degree in fine arts from the Art Academy in Malmö from 2011. Celie has also had time for one year at The International Academy of Art Palestine, Ramallah, West Bank of Palestine. Celie Eklund is also current working as curator and artist with an exhibition at Arbetets Museum in Norrköping this autumn. Opening on Saturday, October 31, at 12-16. The exhibition will run until 22 of November. Open Friday 13-17 and Saturday – Sunday 12-16.